Not as high quality as the top Roland or Yamaha percussion pads, but this is significantly cheaper. Whether you’re a pro drummer or an amateur who needs a good kit to practice on, you can enjoy professional sounds and drumming experience with the PylePro Portable Drums. As the name suggests, this drum kit is portable, which is one of its biggest advantages. Traditional drum kits are huge, which can get quite inconvenient in different situations. Luckily, there are smaller and portable drumming solutions that provide the same if not better sounds and quality. One such solution is the PylePro Portable Drum kit. Whether you don’t have enough space for a full size drumming kit or you need something to practice with on the go, this drumming set will do the job. Therefore, without further ado let’s get into the review of the features the PylePro Portable Drums kit has to offer! For starters, the PylePro Portable Drums set is a digital drum kit with seven pads. All seven pads feature advanced touch sensitivity and provide a very accurate response. This drum kit is basically an all-in-one portable drum set, featuring 25 built-in presets. It allows you to customize your music through an easy to use computer software. Thus, the PylePro Portable Drums kit is compatible with Mac and PC as well and comes with the MIDI connectivity option. Being a super lightweight and portable solution, this is the perfect drum kit to take with you on the go and perfect your drumming and music-making skills. The kit also comes with convenient speaker features, allowing you to either use the internal speaker or the headphones. 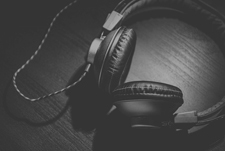 Therefore, you can practice your skills without disturbing those around you by simply plugging in your headphones. The PylePro Portable Drums kit comes with two pedals, providing the feel and the drumming experience of a real, full size kit. Thus, you can get the real feel of a kick drum and hi hit pedal without taking up much space. This device is also customizable, allowing you to tweak and adjust settings as well as edit your own music through a computer software. Simply connect the drum kit with your computer using the USB cable that comes with it and enjoy the many customizing features. 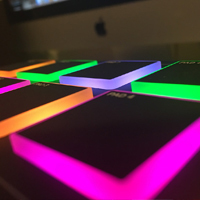 The PlyePro Portable Drums feature a nice LED display that gives you easy access to all options and settings. As a new player you will need to learn the basics of drumming, which is quite easy with this 7 pad digital drum kit. Thanks to its compact size and the responsive pads, this drum set makes for a great practice set for beginners. The main features you should focus on as a new player is are the built-in metronome and the reverb effect. These features will help you follow your rhythm and improve your drumming skills through practice. You can also play along the built-in songs to get a better feel of a real drumming experience followed by other instruments. All these features will allow you to improve your skills faster and become a drumming pro in no time! Your first sounds with the PylePro Portable Drums may not be perfect on their own but you can easily customize and tweak them. Connect the device to your Mac or PC and use any computer software to give your sounds a little makeover. Furthermore, you should know that the PylePro Portable Drums set can either run on batteries or with the AC adaptor that comes with it. The batteries feature is quite convenient, as you will be able to not only use the device on the go but also in places where you don’t have access to electric power. Lastly, you can even create your own kit with the PylePro Portable Drums and store it for future use. Simply choose from 215 different percussion voices and experiment with sounds until you make your own masterpiece. Overall, the PylePro Portable Drums kit comes with everything you need for an enjoyable drumming experience. The seven responsive digital pads allow great touch sensitivity and create good quality sounds. 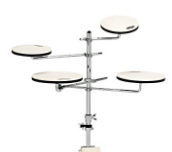 Features such as the 25 built-in presets, the kick drum and hi hat pedals, internal speaker and the headphone jack make this device stand out among other portable drums on the market. 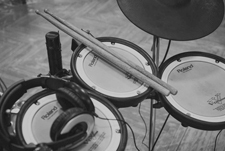 With this drum set you will be able to produce high quality sounds and improve your drumming skills without disturbing others by using headphones. 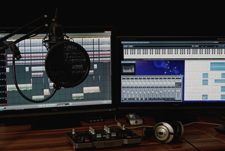 Other interesting features including the ability to create and store your own kit and customize your music in computer software come in handy for both professional and amateur players. However, even with all these great additions, the best advantage of this drumming kit is its portability. You can take it anywhere and play without access to electric power. If you don’t plan on playing the drums on the go, they are still convenient if you don’t have enough space for a full size drum kit. Most importantly, even though it is compact and portable, this drumming set plays like a real one! You can use it to improve your skills and practice your drumming expertise while creating customized sounds. The digital top panel will allow you easy access to various audio configuration controls for sound customization. Overall, this set is well worth the money for both professionals and those looking to have some fun drumming at home or on the go! 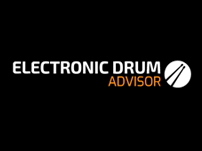 If you want to check out more percussion pads, make sure to read our popular article on the best electronic drum pads.